This talk is to help resolve different practical issues with using git. We will see some more comfortable ways of doing things. Nothing special about them: a wrapper to all of the normal git commands. They provide a more comfortable and safe way of doing the same things. These are included in "standard" git. Allows browsing of history, seeing old versions, etc. Run git gui from within the project directory. Uses the same terminology as git, so you still need to know your stuff. The GUIs use this concept, so you need to know the terminology. My previous talks have not covered this for purposes of simplicity. Right click to stage certain hunks, or stage all files (Stage Changed button), or all of one file (Commit Menu->Stage to Commit). These exercises are for basic usage of the GUIs. Download the packed files: examples.tar.gz and untar them. Change to the dynsegment directory. Start git gui and explore some. Find the changed files and what the latest changes are (top left, top right). 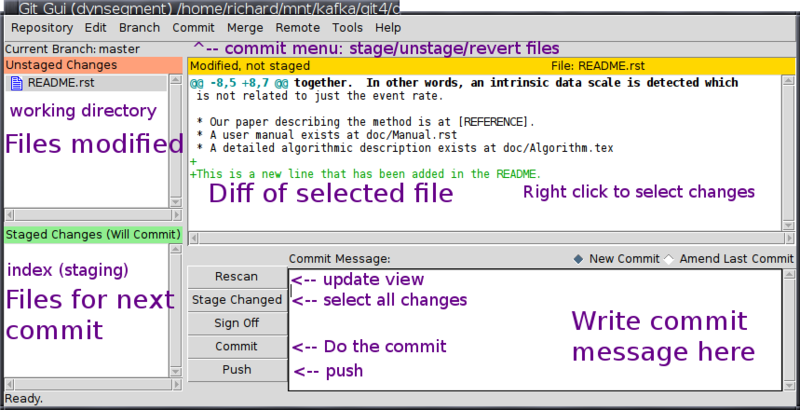 Stage each of the changes (right click on the diffs, Commit-->Stage to commit, or Stage Changed button). Change to the dynsegment-pull directory (in examples.tar.gz) and start git gui. Everything should be already ready for the following steps. Merge -> Local Merge. Make sure origin/master is selected. Click Visualize to see what will happen. This shows all of the new changes using gitk. When done, close gitk. A conflict happens when two people edit the same place at the same time. Reduce Δt so that changes don't overlap in time (push/pull more often). Reduce Δx so that changes aren't in the same line. Pull, work, commit, push repeat. Before doing (major) changes, tell others and get a write lock. Don't have too much text on one line. You have: The "BASE" version, your version (HEAD), and other version. Instead of conflict markers, there are graphical tools to use. Left side is your changes, right side is remote changes, middle is merged copy. Make the center be the version you want, save it, and close. 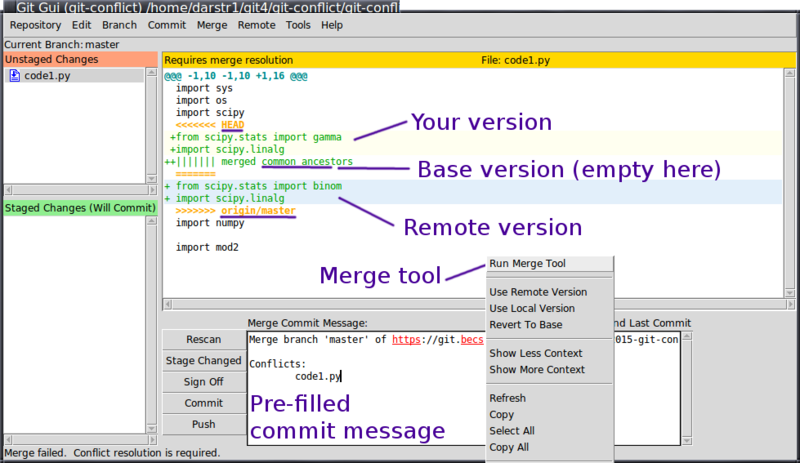 From git gui: After merge that has conflict, right click and select merge. Meld has options for ignoring whitespace, line breaks, doing word diffs, and so on that can be good for LaTeX or malformed files. Change to the git-conflict repository (cd ../git-conflict/) that is included in the examples.tar.gz from above. You can do this either by the command line or git gui. Better yet, you could do both (but not at the same time). Start git gui in the directory. Make sure that there are no unstaged changes. Repository -> Visualize all branch history. Observe what you see for master and origin/master. Close gitk. Visualize all branch history again. How did origin/master change? Close gitk again. In git gui, Merge -> Local Merge. Confirm that the defaults are what you want, mainly, origin/master. Click Merge. The command will fail. If you read the message, you see that there is a conflict and you have to fix it. Install the Debian/Ubuntu package meld (if you can). Observe the current state of the repository. You see some unstaged changes. You should see the conflict markers in the file. HEAD indicates your side, origin/master indicates the server version. merged common ancestors indicates the "base" version. Notice the pre-filled commit message, that has the standard text. This reminds you that a merge is in progress and you shouldn't do other work until you handle this. You could resolve the conflict right in the GUI, if you wanted. Don't do that yet, though. Mac: You will have to resolve the conflict right in the GUI. I haven't gotten meld to work on OSX yet. If you don't have meld installed: Resolve right in the GUI. Edit the files. Remove the conflict markers and put the two changes together. Edit the commit message, if you want, and click the Commit button. Right click on the file and click Run Merge Tool. (If needed, you can specify the merge tool as meld under Edit -> Options). You are presented with your changes on the left, the remote changes on the right, and the current version in the middle. Use the arrows and also keyboard to merge the files together. You can hold alt/control/shift to adjust what meld does. My recommendation is to pick one of the sides and move it to the middle. Then, see what else is different on the other side, and add that to the middle. When you are done, save the file in meld and exit. 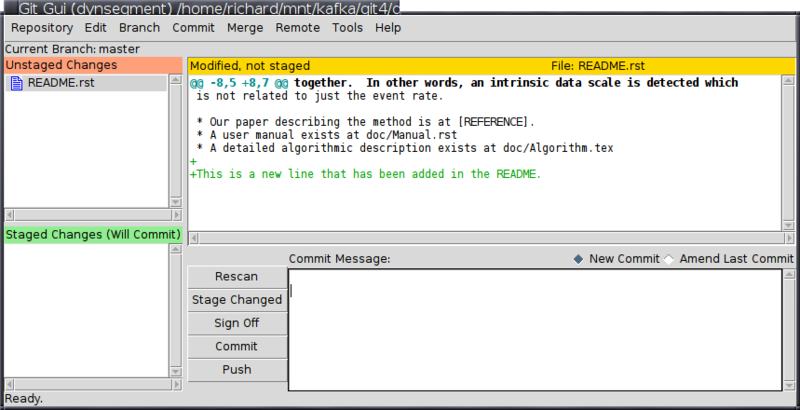 Stage the file, then commit. Don't have a paragraph all on one line - Merge Δx is large! Have one sentence per line. Use an editor that wraps lines, but only when you tell it to. Produce pretty diff between any two versions of a LaTeX file. How to structure a join project? One main codebase. Gitlab is the master copy. Each person has their working copy. Common data exists in another location. Used to mark an important version. This leads to a "detached head" which will cause problems! Try to avoid git checkout VERSION, because 25% of the time you will forget about it and be in a "detached head" state. If this happens, ask Richard for advice. Discuss among all the group about modifications. Make modifications and pus them back. Try to minimize conflicts!